A response to recurring complaints from world-famous author, Brit-blogger, pundit, medical professional, and charismatic ombudsman, Dr. Adrian Warnock. This is part 1. Part 2 will follow very soon. he esteemed Dr. Warnock has made yet another post (plus a bonus follow-up comment) objecting to the look and feel of our polemic against some stylish doctrines and ministry philosophies which have borne notoriously rotten fruits. Specifically, he suggests that in last Monday's Pyro-post I ought not to have criticized Willow Creek's pragmatic, program-driven ministry philosophy without first saying something really nice and affirmative about them. These are, of course, issues we have discussed with the good Doctor before. I was going to let it pass this time, but he e-mailed me, inviting my reply. So let's analyze Dr. Warnock's view of "discernment" a little more closely. He insists that "we really must be looking for the good in people, especially in those who have not denied important aspects of the Gospel." Note: in this context, Dr. Warnock is not talking about personal relationships between individual Christians; he is setting forth a principle for how we critique and interact with leaders of new movements, teachers of novel doctrines, and purveyors of new philosophies of ministry. Let's call it Warnock's First Rule of Discernment. In Dr. Warnock's estimation, my failure to go out of my way to say anything positive about Willow Creek "seemed (at least to [him]) to be implying that Willow Creek has absolutely nothing to teach us." I said nothing like that, of course, and it's a wholly unwarranted conclusion from what I did say. It's also quite irrelevant to any point I was making. On the other hand, let's be completely candid: Even if I did go out of my way to catalogue everything I like about the Willow Creek model, it would indeed be a very short list. In fact, as I ponder the question even now, I'm hard-pressed to think of anything truly distinctive about Willow Creek's approach to ministry that I could honestly say advances the agenda of Christ's kingdom. Willow Creek's underlying philosophy is fundamentally pragmatic, not biblical. By their own admission, it is now statistically clear that their strategy does not produce authentic disciplesand therefore fails even the pragmatic test. So it's a bad ministry model even by its own definition of what's "good." More importantly, the movement also falls short by every biblical standard I can think of. Its influence among evangelicals for more than three decades has been seriously, consistently, and (I believe) demonstrably bad in numerous ways. It's about to get even worse. So it would frankly bother my conscience to leave the impression (even inadvertently) that I think there's anything worth singling out as wholesome or beneficial or worthy of my affirmation in that. To illustrate: There might be many nutritious scraps of food garbage in a compost heap, but if something in you compels you to go out of your way to point them out to an undiscerning toddler, shame on you. 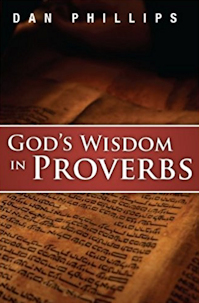 However, according to Dr. Warnock, "if we fail to recognize something as being good and helpful and true, we fail in our discernment as much as if we blindly accepted everything in a naive way." OK, but what if the thing being evaluated is really not "good and helpful and true"? Because (and this is the crucial point where I take issue with Dr. Warnock's position) the fact that a person or movement has commendable qualities (even lots of them) does not necessarily make the thing itself "good and helpful and true." Let's call that Johnson's Fifth Axiom of Common Sense. But as Paul labored to demonstrate in Galatians, one apparently small, technical difference like that can and sometimes does make the difference between the true gospel and a different, damning, false gospel. Thus you'll never find Paul saying anything positive about the Judaizers. Moreover, in Galatians 2, Paul publicly rebuked Peter just for treating that false gospel like a mere misdemeanoreven though Peter himself was an apostle of Christ who completely, unconditionally, and unreservedly affirmed the true gospel. Yet Paul did not pillow his public rebuke (or even his retelling of it) in a lot of superfluous affirmations of Peter's good intentions, or his likeable personality, or his commitment to Christ, or whatever. It was a sharp and completely unqualified public rebukeand under the circumstances, it was warranted. One's "tone" is not always the most important factor in raising a caution about false doctrine. In short, Warnock's First Rule of Discernment isn't biblical. Given the enormity of the errors we are talking about in the Willow Creek philosophy, Dr. Warnock's objection to straightforward criticism of that movement strikes me as terribly misguided and question-beggingand inconsistent with what he himself says in other contexts. For example, is Willow Creek's commitment to "important aspects of the Gospel" truly beyond question or criticism? I certainly don't think so. After all, they are sponsoring a major conferenceunveiling their new agendawith Brian McLaren as the keynote speaker. He is notorious for having portrayed the principle of penal substitution as "one more injustice in the cosmic equation . . . divine child abuse. You know?" There's hardly a single gospel-related doctrine that was highlighted in the Protestant Reformation that McLaren has not somehow questioned or attacked, and the atonement is central to all the others. As a matter of fact, based on Dr. Warnock's own steadfast (and excellent) defense of penal substitutionary atonement, I'm mystified as to why he objects to a shrill and unqualified warning about the direction Willow seems headed. My strong suspicion is that Dr. Warnock's most basic objection to my "discernment style" has nothing whatsoever to do with any of the concerns I have raised about Willow Creek. I think the root of his real disagreement with me lies in our difference of opinion on the charismatic question. Usually, when he makes critical posts about TeamPyro, that's the central issue he brings upand this latest dust-up is no exception. But that's a whole different issue, and here Dr. Warnock's complaint becomes somewhat more nuanced. I want to answer that part of his argument, too, but that will have to wait for another day. So I'll be back to follow this up [tomorrow, if not before]. Before I read this post, I was the first guy in my circle of friends to show the “Gospel driven” agenda of the Creeker’s. Especially the efforts they make in spreading the Gospel. The zeal their planning, preaching in season and out of season. 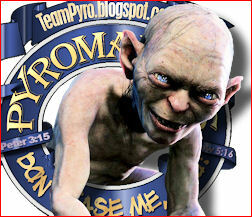 First, though, I'd just like to say that Team Pyro has some excellent qualities. they use full sentences most of the time with proper grammar. other times their sentences are short, terse, pointed, and short. 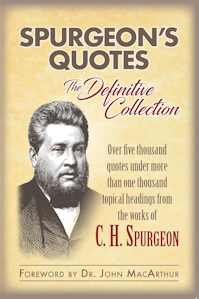 I also like that there are three writers on this blog, plus Spurgeon. He is a good blogger. A three-fold strand is not easily broken. However, and here is the big "but", and you knew this was coming because I spent many words insincerely flattering them about things that really don't amount to a hill-o-beans. But, I'm on the attack, and I don't want to sound like an insensitive dweeb...even though I may be an undiscerning dweeb. 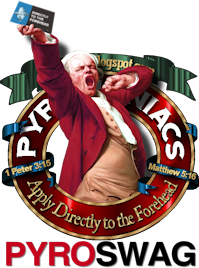 Here's my big complaint: TeamPyro likes to use their laser sharp focus to point out all the dangerous fads in Christianity. Now really, can't we just all get along? WWJD? All this negativity is just draining my oil pan. What would Jabez Do? How about a post or two on how I can have my best life now, or how to have an effective 20-minute altar call. And who are TeamPyro that they can call out a doctor? And a big ole church in chicagoland? Who <> are <> you? Who <> Who <> are <> you? You know I really want to know. I take it your tongue is firmly planted in your cheeck and I am loving it. Is this (http://www.willowcreek.com/events/leadership/) the Willow Creek of which you speak? If so, the only thing anyone has to do is to go to that link that I have posted and see that they have a Rev. Brenda (a woman, yes) as one of their speakers at their upcoming conference. 11 A woman must quietly receive instruction with entire submissiveness. 12 But I do not allow a woman to teach or exercise authority over a man, but to remain quiet. If this is the same Willow Creek it is a "soft-ball" discernment question concerning their organization. Also I noticed Steven Furtick as one of the speakers at that same upcoming event. 6 Likewise urge the young men to be sensible ; 7 in all things show yourself to be an example of good deeds, with purity in doctrine, dignified, 8 sound in speech which is beyond reproach, so that the opponent will be put to shame, having nothing bad to say about us. Sound familiar? These issues are clearly timeless, when will we learn? Excellent repost! Until about a year ago I probably would have been on Warnock's side, but have been firmly swayed to the biblical side. There is that movement of the 'new-"Calvinists"', which I used to say, "Well this, this, this, and that are good, but...(insert laundry list)...needs improvement!" But in the past year I've seen that what is good isn't enough to outweigh their bad, and the fruit of their followers is almost totally rotten. If the problem is small and the good FAR outweighs the bad, then maybe we ought to point out the good first. For a shameless plug, this is how I reviewed David Platt's first book which was awful but I didn't want my readers to think Platt was an all out heretic. 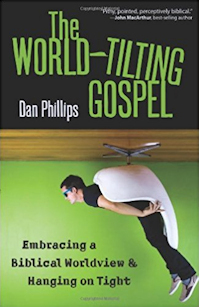 And similarly, I just read Dan Phillip's new book, I had one gripe with it, but I'm not sure if it will end up in my review yet, because the good so far outweighs that one thing (but then again, that one thing is probably preference and certainly isn't heresy). Just thinking in type...good repost. I can speak for myself and say it plainly: I am a painfully-sinful man who will be lost unless Christ saves me. Look at the tense of those verbs and let that sink in. I am lost unless Christ. And the major distinction between the blogging you find here and other attempts to do what we do here is this: we are serious about everyone who is a sinner seeing it that way for themselves. That is why we generally write posts that say in essence, "not that, but this." The imitators are really usually just "not that" people. Without the "but this," we are just pundits. Good teaching Phil. I can have a spirit like Adrian at times. And I can swing all the way to the self-righteous side as well. I thank our Lord for TeamPyro, where these three amigos surely speak the truth in love. The grace of our Savior is truly evident here. The posts always have a humble boldness. Have a terrific weekend in our Lord's love and presence on Sunday. To Jesus Christ be all honor and glory, for He is worthy, and His precious blood is more precious than any other thing. Phil - since this was first posted nigh unto four years ago, in your estimation what's the update on WillowCreek's "progress"? Have they continued to go all Emerg-ey on us? I haven't been paying attention, but even if I had I would not be in as good a position to judge as you are, sir. Thanks. This is the reason that I come to this blog. Y'all are not ashamed of the truth of the Word and also do not let fear of man overshadow the fear of God. And you call us to examine ourselves in light of the truth of Scripture. I wish that more Christians appreciated the need for this in all of our lives. I often wonder if this is an English thing - we're quite prone to be apologetic about ourselves and somewhat embarrassed about being direct. Not that every English person is like this of course, but I can certainly identify it in myself - like a knack for obedient and polite queueing. Could be a Brit thing, but most definitely is a Postmodernist thing. That is the same here in the US, too. That's why we have the tone police. May I ask what has precipitated this re-post? Jules: "May I ask what has precipitated this re-post?" Nothing specific to the topic of THIS post. Part 2 of the two-parter relates to the theme of continuationism vs. cessationism, so I wanted to repost that. But in order to give part 2 its proper context, I reposted both parts. Thank you, Phil. As a Kansas City native, I appreciate both posts immensely.